The International Institute for Young Musicians International Piano Competition will take place July 13, 14 and 15, 2019 in Swarthout Recital Hall located on the campus of the University of Kansas in Lawrence. The IIYM International Piano Competition serves students, families, and teachers who are passionately committed to the art of piano performance. It is a celebration of their talents and an opportunity to gain recognition, enlarge their experience and compete for scholarships and cash prizes. The semi-final and final rounds of the competition are free and open to the public. The competition is open to students of any nationality born after July 1, 1999 and before July 1, 2008. Students must also enroll in the 2019 IIYM Summer Music Academy at the University of Kansas. Complete the combined Summer Music Academy and International Piano Competition application form, submit a good-quality video via Youtube link, and send a $100 application fee (includes both Music Academy and Competition applications fees) by April 1, 2019. Please also mail age proof (copy of driving license, passport or birth certificate). 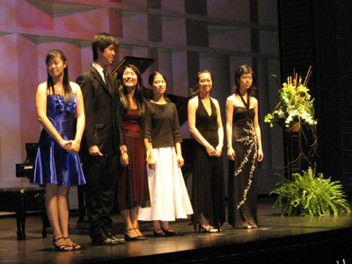 Each round of the IIYM Piano Competition is judged using a “blind” system, based on numerical rankings that are tabulated mathematically by IIYM staff members. Numbers, not names, identify each student. Discussion of entrant performances is not permitted until after the votes have been tabulated. Judges are not permitted to vote for or otherwise identify their own students. All competition applicants must submit a good-quality video. Preliminary audition should be submitted via Youtube link or some other online storages(such as youku or QQ). Once uploaded, email the link to chung@iiym.com. The order of performance for semi-final contestants will be chosen by drawing on Jully 13, 2019. Contestants will have an opportunity to try the competition piano on July 13, 2019 and warm-up rooms will be provided on day of competition. The order of performance for final round contestants chosen by drawing on July 14, 2019 following announcements of finalists. Warm-up rooms will be provided on day of competition.